PitchPerfect iPhone App Review. Quite a while ago I had been using another free tuning application for my acoustic guitar. However it was a bit imprecise, quite ugly to look at, and changing tuning was a hassle because it required stopping everything and rebooting. When I decided it was time for a change I came across PitchPerfect App for iPhone, which I eagerly downloaded given the previous positive experiences I had with NCH Software. From the beginning I quite liked it: PitchPerfect iPhone App was free, light to download, quick to install and very light on system resources. Frankly I don’t remember much about those first steps or the installation process, however I recall using being able to use it immediately to quickly re-tune my instrument. It was easy and intuitive to use and very responsive to sounds, even those coming in from my somewhat crappy mic which came as a surprise after my previous experiences with other tuning devices that all seemed to stall in a noisy room. There are two main components to the open PitchPerfect iPhone program: the “tuning bar” and the string selector. According to the tuning and string selected, the tuning bar does a great job indicating whether the string needs to be tuned up or down. It is very intuitive to do and I’ve found it to be quite accurate too. The string selector makes a great visual aid on making it easy for everyone to tune correctly, even if you have never played an instrument before. 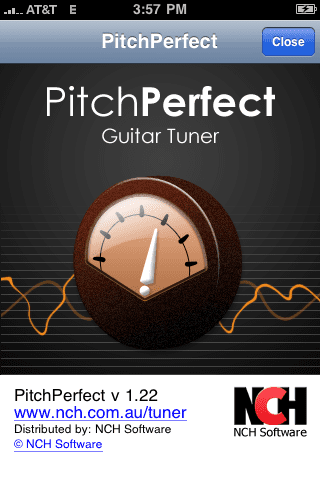 PitchPerfect application makes a great companion to the newbie guitarist. And while I personally only play the guitar, I feel confident it would work just as well with any of the other instruments PitchPerfect has setting for. There are a few setbacks, however. Sometimes, with the lowest strings, the audio signal is unrecognised and a NO SIGNAL message appears; it usually resolves after a very brief period of silence. This can happen often, though not quite so often that it becomes a nuisance. Other problem/request is that one of my favorite tunings, the New Standard Tuning, is not available as a default setting. I am still able to set- it up for this tuning checking the current string tuning on the “tuning bar” but I would like to have the option to add some of very obscure tunings to the presets; however most of the world’s guitarists will find the default options more than adequate. Anyway using PitchPerfect app for iPhone is a no brainer. No other program beats its unique combination of lightness, visual candy and overall quality. Best of all, it’s free. Download PitchPerfect iPhone App Here or Here.